First I got into the head of a psycho, then an alcoholic, and now in Memoirs of a Porcupine (published in French in 2006 and translated into English in 2011) I get into the head of a porcupine. What will Alain Mabanckou think of next? After being the harmful (animal) double for many years to his human master, our narrator, who is finally free from his master, is ready to tell us all about his long porcupine life. 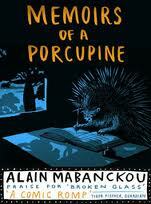 And for "porcupine's sake" you should really read this memoir because this porcupine has had a very interesting life. Like Broken Glass, there aren't full stops, only commas and more commas. And like Broken Glass, if you are able to look past that it is a really enjoyable read. “The myth of the double exists not only in my own village; a lot of African readers have told me that in their country people also believe in having an animal as a double”. Other than African folklore and myths (this is a story about animal doubles and magic), there’s also some crime. There are also many interesting characters we meet along the way - both in the animal (his description of squirrels was hilarious) and human world. His master is a particularly interesting character and in a way through him you get to see the just how bad inferiority complexes can be sometimes. While reading it, I tried to tell my sister and a few friends about this novel. I tried to explain to them that yes a porcupine (literally, not figuratively) was telling his life story. I even had to show them the cover because what better way to explain a porcupine writing his memoir than the beautiful image on the book cover. They all laughed because they couldn't believe it. That's the thing - the premise of the novel is hilarious and when you do read it you are just shocked and amused at what this porcupine has gone through. Like with his other two novels, as well as being funny, Memoirs of a Porcupine also has some shocking content. There is something else I do love about Alain Mabanckou's novel - characters from previous books always make a brief appearance. Angoualima did so in Broken Glass and now Stubborn Snail does so in Memoirs of a Porcupine. I didn’t want to make any assumptions about Alain Mabanckou after reading African Psyho, but after Broken Glass I became a fan, and now after reading Memoirs of a Porcupine - can I just come out and say that he is an amazing author and the stories he comes up with are pretty much amazing. With only a few days to go until this month ends, I am off to start Black Bazaar.